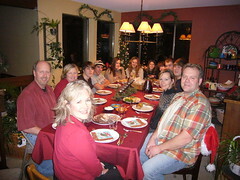 Celebration of Christmas this year was shared with the Eide family (Esther's two brothers and families.) The weekend was filled with eating, talking and playing the Wii. All of the adults took their turn at flinging the Wii remote back and forth through the air. Meals included among other goodies: oyster stew, clam chowder, sausage egg balls, peppermint jellow and pork tenderloin. We appreciate our large house with fourteen bodies spending the three days together.